With Fastlane quickly approaching (which can be seen on the WWE Network FREE for the month of February for new subscribers,) The WWE returned to Columbus, OH for this week’s action packed edition of Monday Night Raw! Conflict ran rampant as tempers flared and tensions continued to strain. In a night where team work was key, which WWE Superstars lacked communication skills and who continued to do what was Best for Business? Find Out NOW! Business kicked off with Roman Reigns. The Big Dog is not happy about the events that transpired last week. He isn’t happy that the Authority doesn’t see him as THE Guy, but that he would prove himself by beating Daniel Bryan at Fastlane and then move on to beat Brock Lesnar for the World Heavyweight Title at Wrestlemania, and any one who got in his way, well, he had a spear with their name on it. Cue the leader of the Yes Movement. He came down to the ring and began to thank Reigns for his aid in defeating Seth Rollins last week (he’s a little garden gnome…) He also ran down a few way Roman was better than he but ultimately stated the he was a better WRESTLER than the Samoan Superman. And that he would use those superior wrestling skills to beat Roman at Fastlane to get a shot at the Beast Incarnate. Luckily, before their start down could turn in to anything violent, The Authority intervenes. Stephanie reprimands Roman for his unjustified actions against the innocent Big Show in last weeks main event. She also admonished Daniel Bryan for stuffing Kane into a casket, the place dead people go to rot. As punishment for their actions, Stephanie did what’s best for business and teameds the two trouble makers together in a tag team match against Kane and the Big Show. A match that would start right then! The Authority stayed ringside to witness the destruction of Daniel Bryan and Roman Reigns. The match began with Daniel Bryan taking control early with his speed and athleticism against Kane. When the Goat tagged in his partner, Roman continued the punishment but Kane, being the veteran, weathered the onslaught and took control of the match for his team. He and Big Show would isolate the Samoan Superman from his team mate and snuff out any attempt at a rally. However, Reigns was able to muscle his way out of a submission and deliver a separation causing suplex that allowed the B+ player to tag in to the fight. The pace of the match increased exponentially as Daniel Bryan exploded into the match. But his ego got the best of him as he attempted to dive onto the two biggest men in the WWE and got caught, putting an end to his momentum shift. 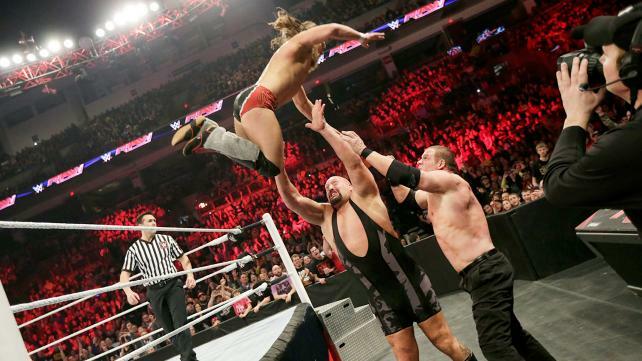 Big Show and Kane would continue to wear Bryan down with powerful moves and quick tags to keep the fresh man in. But the Beard was able to roll out of the falling Big Show, who decided high risk was what a giant should do and failed miserably, and attempted to crawl across the ring to tag in Roman Reigns. But Show tagged in his partner first and Kane prevented Bryan from reaching his goal. When he turned back to Bryan, the Goat suckered him in and locked in the Yes Lock. But Big Show saved the match for his team and pulled Bryan from the ring. But the over zealous Show then threw D-Bry into the time keepers area and forced the DQ. After the bell rang, the World’s Largest Athlete and the Devils favorite Demon continued to punish Reigns and Bryan. But the Big Dog used a steel chair to take out the Big Show. Kane saw his Authority team mate in danger and aided him snuffing out Reigns’ attack. Ryan attempted to aid his partner, but Kane side stepped and Daniel crashed into Roman. What little communication they had broke down as Roman shoved Bryan to the mat. Before things could further degenerate between the two Fastlane opponents, Triple H announced that they would get the chance to work on their team work one more time in a match. The match would be Roman Reigns and Daniel Bryan vs Kane, The Big Show, J & J Security, and the living breathing undisputed future of the WWE, Seth Rollins! This match was okay. Nothing to shout about but it was entertaining. It set up the night and did a good job of setting up what will be an explosive match at FastLane between Daniel Bryan and Roman Reigns. You all know how I feel about Big Show, that hasn’t changed, I still can’t stand to see him in the ring. He makes watching paint dry exciting. Kane was the high light of his team. Roman had some good offense, but spent the majority of his time in the match on the ring apron or getting beat up. Not exactly the best showing. Daniel Bryan carried this match. But they get the chance to wow me again in the Main Event! WOOT! The Savior of the WWE took control of this battle early on (as is to be expected.) The statement to be made, don’t mess with the Authority. When ever it seemed Ryback was fighting back, the nimble J & J Security would make their presence felt. Rollins would continue to wear down the Big Guy through out the match but Ryback was able to counter and get some offense on Mr. Money in the Bank and forced him to regroup with Jamie and Joey on the outside. 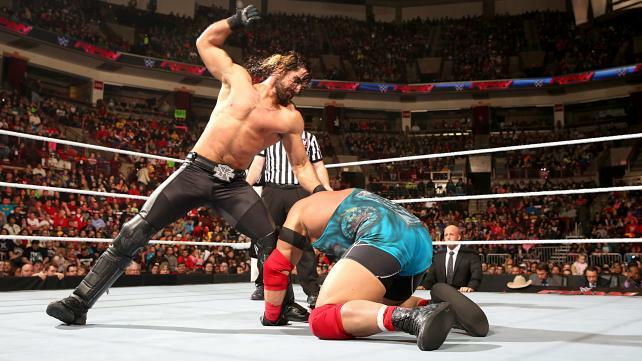 Rollins directed his men in the best way to approach the threat in thee ring. Things did not go as planned as once back in the ring, Ryback kept his offensive momentum and was able to set Seth up for a Shellshock. Before the devastating maneuver was was executed, Noble and Mercury felt the need to intercede on Rollins behalf and attacked Ryback, causing the disqualification. After the bell rang, the future world heavy weight champion and his men, continued their beating on Ryback that ended in the Avada Kedavara and a curb stomp. You know I enjoyed this match. Any chance to see Seth and co. prove that going up against the Authority is never a good idea. They made a beautiful example of the Big Guy and showed what happens to those who think that they can go toe to toe. Sure some people will say that Seth can’t win without J & J Security helping him. To you I say, he doesn’t need them. Never has, never will. But why do things alone when you CAN have help. It’s all about the numbers game after all. Paige started off hard against Brie as she caught her with a Thesz press to begin the match. Her frustration over the antics of the Bella Twins fueled her aggression and, the Anti Diva was on fire. Brie was able to capitalize on the ref distracting Paige for a moment to mount an offense of her own as she used submission holds to wear down the ex Diva’s champion. As Paige began to rally, Bella shut her down with a second rope drop kick. But Paige would not give up as she did fight back and regain control of the match against the Goat’s wife. Nikki attempted to distract Paige for her sister, but the pale diva threw Brie into the ropes and knocked the Diva’s Champion to the ground before she nailed Brie with the Ram-Paige to pick up a win over one half of the Bella Twins. Rusev and Lana came down to the ring to address the WWE Universe and to honor the United States Champion’s Fastlane adversary, John Cena. They began with a video tribute to the man I wish we couldn’t see that ended on a high note of that showed exactly why Rusev will crush Cena at Fastlane. Lana and Rusev then both took the opportunity to explain that because the 15 time loser had been around and endured so much, that his body was broken on the inside and that he was vulnerable. That Cena had lost his ruthless aggression. Rusev then vowed to crush Cena at Fastlane which elicited more verbal barbs from Cena toward both Rusev and Lana, which led to the United States Champion defending the honor of the Ravishing Russian. He attacked Cena and the brawl ended up on the entrance ramp. It looked as if Cena would be able to hold his own, but it was not to be. The Bulgarian Brute was able to land a blow on Jon Cena’s injured eye, and the face that thinks it runs the place went down as official’s finally separated the two. It’s always nice when one opponent honors another. It’s a show of respect and good sportsmanship. However, when that honored opponent then responds with an unjustified attack and verbal barbs, it just shows how undeserving of the adulation they truly are. Rusev and Lana tried to do something nice only to have it thrown back in their faces by John Cena. Is it any wonder neither of them like the United States? Cena just made a bunch of their points about American’s valid. John Cena made me embarrassed for my country. Rusev. Lana. I thank you for that moving John Cena tribute. I can tell it came from a place of the heart. Good Luck at Fastlane! In a rematch from last Monday, Dolph Ziggler looked to put away the Eater of Worlds. However, Bray Wyatt had other plans for the Show Off. He used his strength and his hard hitting unorthodox style to wear down the former Intercontinental Champion. But Dolph would battle back and hit a neck breaker that looked as if it would swing offensive momentum in his favor and added a chin lock to the mix in his attempt to keep Wyatt reeling. The two traded offensive blows which Bray caught the worst of as a drop kick led to a bloody nose. Ziggler threw every thing he had at Bray in an attempt to put the former leader of the Wyatt family down. But blood was not going to keep Wyatt from achieving his goals as he fought hard and made Ziggler look absolutely fabulous (no one looks more gorgeous than Ziggler when he is knocked out and taking a beating.) He weathered the storm of Dolph’s DDT and elbow drop and caught Ziggler ina Sister Abigail for the 1, 2, 3. But Wyatt was not finished. He tried to make an example of Ziggler. He pulled the mats up and exposed the concrete underneath, but before he could finish his brutal display, the officials came to the Show Off’s aid. These two put on another great match. It was brutal and viscous and everything I’ve come to expect from Bray Wyatt and Dolph Ziggler. Their two styles mesh so beautifully in their contrast. Dolph’s little engine that could mind set makes him a perfect opponent to some one who enjoys mercilessly destroying their opponents. It’s good to see Bray Wyatt strong again. After his clash with Cena, he looked anything but. Dolph of course looked amazing in defeat. No one takes a beating like he does. Oh and he’s a great wrestler too. In an unexpected treat, the WWE Universe was blessed by with an appearance by World Heavy Weight Champion, Brock Lesnar and his advocate, Paul Heyman. Heyman felt it necessary to address the up coming match at Fastlane between Roman Reigns and Daniel Bryan, but to also discuss the matter of honesty. He stated that Reigns and Bryan were two of the biggest liars on the planet because they actually stated that they could beat the Beast Incarnate at Wrestlemania. He then stated that neither one stood a chance against his client and then reiterated why Brock Lesnar would destroy either man who ended up facing him in the main event at Wrestlmania. I do so love it when Paul Heyman has a microphone. The way he says things, it just makes sense. Why would Bryan and Reigns ever stand a chance against the Beast? If Seth Rollins was unable to beat Lesnar, how could a Goat or a Big Dog take out the Beast? 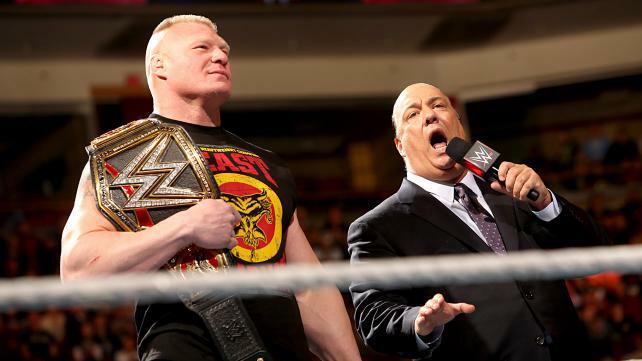 (but Rollins was able to break Brock’s ribs…) And I do so love how Lesnar just stands there as Paul talks. He’s got this little smirk that you just know he is not worried about either man in the slightest. He doesn’t NEED to say anything. Lesnar lets his actions speak for themselves. Who ever does face him for the title, will be in the fight of their life that will leave them a different man after the bell rings. Yep, Stardust is hear to stay folks. He has lost himself to it. But who can blame the boy. He was Cody for so long and it got him no where. Now that he’s Stardust, he can express himself in ways he denied himself before. Why can’t people just accept that he is Stardust? Respect the man’s wishes and don’t call him Cody. The match itself was bleh… nothing special and like I mentioned above, the New Day are not getting over. Not even booed. Just meh from the crowd. I’d feel bad for them but I’m one of those that’s meh towards them. Earlier in the evening, Triple H informed the WWE Universe, that he was tired of waiting on an answer from Sting. He had issued the challenge two weeks ago for the meddlesome vigilante to meet him face to face at Fastlane and now it was time for an answer. The COO of the WWE came down to the ring and addressed the situation. He stated that had Sting arrived in the WWE any earlier, that Sting would have been exposed him as the coward that he demonstrated himself to be when he involved himself in Survivor Series and then again when he interfered on Raw.Triple H vowed that he would explain to Sting why staying away is the better option and that if he accepted Triple H’s face to face, Hunter would let Sting leave Fastlane with his dignity. As the WWE Universe waited for an answer, the lights dimmed and in the arena and the sound of crows echoed in the darkness. A spot light shined randomly into the crowd as everyone wondered what would happen. All of a sudden a figure appeared in the ring next to Hunter. So unexpected was this presence that Triple H lost his footing and fell to the mat. A moment later the words “I ACCEPT” could be seen on the titantron. So finally Hunter gets to face that no good Sting and make him pay for his sticking his nose in business that was of no concern to him. Sure Hunter didn’t look that great when he jumped out of his skin, when fake Sting appeared in the ring. But if you aw fake Sting, you’d have jumped too (really, it was horrendous.) Not sure what to expect out of the face to face other than I have every faith that Triple H will do what’s best for business and run Sting out of the WWE before he really has a chance to establish himself as anything more than John Cena’s twisted fairy god mother. Both Tyson Kidd and Cesaro have beaten an Uso in singles competition. Now as a team they took on the tag team champions in an effort to earn a shot at the WWE Tag Team Titles. Cesaro and Kidd worked together in an effort to keep Jimmy isolated and it worked until Jey was tagged in and the twins proceeded to double team Nattie’s husband. The momentum shifted to favor the tag team champions and Jimmy went to become a flying Uso but Tyson countered, caught Jimmy with his legs and then sent the both of them tumbling to the ground. At this point Naomi and Natalya (who were ringside) began to have heated words but it didn’t really go any further than that. Once back in the ring, the two teams battled for supremacy with the Brass Ring Club getting the tag first and the advantage as Cesaro entered and tossed Jimmy around like a rag doll. But Uso was able to create separation to make the tag to his brother with a kick that sent the King of Swing flying from the ring. Jey was on fire when he got between the ropes against a fresh Tyson Kidd. He used his quickness to keep Kidd on the defensive. The action further picked up as the match continued to a fever pitch as Jimmy went all Uso crazy and dove over the top rope onto Cesaro and Jey caught a flying Kidd with a super kick for a near fall. The end came when Cesaro, who recovered faster than the Uso who flew into him, rolled Jimmy back into the ring to distract the ref. While the ref was concerned with Jimmy, Cesaro then pushed Jey from the top rope allowing Tyson to roll him up into a pin once the ref was back to doing his job officiating the match. So NOW do Tyson Kidd and Cesaro get a tag team title opportunity? Surely one would see them as the #1 contenders for the titles now. They have beaten the Usos in singles and non title competition. Seems only fitting that a championship match be granted to the Brass Ring Club (yes I am aware that’s not their official name but I saw it some place and thought it fitting.) This match was a lot of fun to watch. It is so refreshing to see the Usos in competition with someone different, but it WWE isn’t careful this too could get stale. I say bring on the Ascension for some hard hitting fun! Heck, even Dolph and Ryback would be a fun team in the tag division just for giggles. But hey, Tyson and Cesaro have great chemistry as a team and both are doing amazing in the ring. It’s good to see them get to show case that they do have a right to be there and that they are two of the most under rated wrestlers on the main roster. Poor Damien Mizdow can’t catch a break. After accidentally costing the Miz his match against Sin Cara last week, Mizdow found himself in singles competition against the luchadore. Everything seemed to be going well as the former stunt double kept the high flier grounded. However the needs of the Hollywood A Lister would not wait as the Miz requested that Mizdow fetch him a bottle of water. Mizdow, being an A+ personal assistant, left his match to retrieve a bottle of water for his boss. This time however allowed Sin Cara to recover enough that he was able to fly over the top rope and crash into Damien. Once back in the ring, Mizdow used his superior skills to recover control with a neck breaker and was about to lock in the Figure Four leg lock when Miz again interrupted and demanded that Mizdow not plagiarize his move set any further. This distraction was all Sin Cara needed to roll the former stunt double up for the pin fall. This was a fun turn of events. The match wasn’t bad, it was good and solid. Love watching Damien wrestle. He’s another under rated performer who can tear it up in the ring given a chance. The Miz was gold in this as well. He is an A List actor with needs and deserves respect. But he should be flattered that Mizdow has learned his moves so well. But at the same time I can see why he would be annoyed. Shouldn’t the student attempt to rise above the teachings? Miz worked hard to get where he is, and to see all his hard work used to elevate someone not him? Well, it’s understandable that he would insist that Damien Mizdow get his own moves and stop using his. Curtis Axel came out, STILL complaining about how he was never eliminated from the Royal Rumble, blah blah blah #Axelmania blah blah. Thank the Wrestling Gods in their divine Squared Circle that Dean Ambrose had also heard enough as he came down to the ring to once again shut the former Intercontinental Champion up. Ambrose took it to Axel hard with fists of fury but he was slowed down as Axel caught him with a boot to the midsection. Curtis would further inflict punishment on the Lunatic Fringe in an attempt to keep him worn down. But Ambrose would rebound from a drop kick and bounce off the ropes to catch Curtis Axel with his signature clothes line and then the Unstable one followed it up with a Dirty Deeds for the pin fall. After the match, Ambrose grabbed the microphone and addressed Bad New Barrett’s refusal to grant him a title match. He stated that he would not stop gunning for the champion until he got the title match that he was owed. Of course, this prompted the Intercontinental Champion to respond via the titan tron and BNZ. He stated that just because Dean said he deserved a shot at the title didn’t make it true. BTW, Nursing home turf wars are terrorizing the city. The match was decent enough, I’m just sick of Curtis Axel stating how he’s the rightful winner of the Royal Rumble. Again, pretty sure you have to make it into the ring in order to officially enter. Not anyone else’s fault but his own that he got a bump on the head and decided to call it a night. Take responsibility for your own choices Curtis! Dean Ambrose never disappoints when he’s in the ring or on the microphone. I almost feel sorry for Wade though. Dean has his sights locked on him, and if there is one thing the WWE Universe knows that Dean can do, it’s obsess over something till it consumes him and he gets what ever it is out of his system. The man wants his pretty face on the wall of champions, we are going to see Dean Ambrose’s Face on the wall of champions. Before the bell rang, the valiant members of the Authority looked to make an example of both Reigns and Bryan. Kane and the Big Show punished Roman while J & J Security with the living embodiment of the future, Seth Rollins, pummeled the Garden Gnome. A double choke slam was delivered to the Samoan Superman effectively taking him out of the action for the time being. That left the leader of the Yes Movement in the ring to start things off against the superior wrestler, Seth Rollins. To emphasize Bryan’s inability to grasp what it would mean to be in the ring against Brock Lesnar, Rollins graciously decided to educate him by delivering German suplex after German suplex. Quick tags and hard hitting offense would keep D-Bry on the defensive for much of the match. He would occasionally get in some great offense but was only shut down. Roman Reigns did recover enough in the match to break up a pin attempt but he was rewarded with a knock out punch that sent him back to the floor to enjoy another nap. Just when the WWE Universe feared the worse for their hero, Dolph Ziggler, Ryback, and Erick Rowan stormed the ring. This forced Big Show, Kane and Mr Money in the Bank to defend themselves, which left Jamie Noble and Joey Mercury in the ring to face a recovering Daniel Bryan. The goat took full advantage against the security team laying them both out with a drop kick from the top rope. as Daniel was about to hit the running knee for the win, Reigns (who had just woken up from his siesta,) tagged himself in, hit a spear, picked up the win for his team. 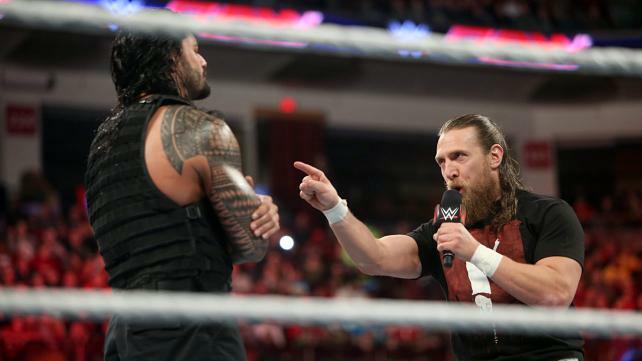 And instead of being grateful for the time of rest, Daniel Bryan was indignant toward his partner and began to have heated words with the Big Dog. As a result Bryan made the first move and shoved Reigns into the ropes which he bounced off of and Speared himself a Goat. I did have so much fun with this match. Sure Roman got a lot of beauty sleep, but he sure did come in handy when it mattered. Breaking up that pin and then spearing one half of J & J to aid his team in picking up the win. The fact that D-Bry was upset proves that he is coming down with a John Cena sickness. Addiction to the spot light. It’s really really sad after all. Guess that means we have to put him down as rabid or something. And what are Dolph, Ryback, and Rowan doing sticking their noses where it doesn’t belong? Didn’t they learn their lesson the last time they tried to go up against the Authority? I think they are just doing it out of spite now. Come on guys, let it go. You got hired back, I doubt your luck would turn out the same if you keep playing with the fire that is Best for business, because eventually you will get burned (again). Big Show and Kane didn’t detract from the match which was a pleasant surprise. J & J Security were just too darn funny. at the end there it looked like Joey was in an Exorcist movie with the way he was rising up to get kicked. And the best for last, Seth Rollins. Wonderful as ever. Never a bad word to be uttered from my lips about him. His ability shines through no matter who he is in the ring with and isn’t it nice of him to try and prepare Daniel Bryan for a match agains the Beast Incarnate? Speaks volumes to the beauty of his character that he would care enough about his opponent’s well being to try and educate them on the hardships ahead. Kudos to you Seth Rollins. You truly are the future of the WWE! This entry was posted on Thursday, February 12th, 2015 at 1:01 pm	and is filed under Events, News, Television. You can follow any responses to this entry through the RSS 2.0 feed. You can skip to the end and leave a response. Pinging is currently not allowed. « Film Review: ‘Kingsman: The Secret Service’! !